Gatwick Greenspace Partnership (part of the Sussex Wildlife Trust) took on the management of Lower Orlton’s Copse, near Rusper, in March of this year *. Since then we have, in consultation with the Forestry Commission, decided as part of the management, to extend a small number of glades to open up the high canopy and improve the amount of ground flora in these areas. Lower Orlton’s Copse is a good example of many woodlands in the south east that are ancient (or semi-ancient) and that (may) have had some traditional use in the past (timber extraction, coppicing, wood burning etc), but which have long since fallen into neglect (as per Rackham's comments). Subsequent growth of the dominant Hornbeams and Oaks, (which keeps most of the forest floor heavily shaded, even in Summer) and over-grazing by the resident Roe Deer population, has meant that there is currently very little in the way of under-storey or shrub layer. In turn, this reduces the amount of available food and shelter for the myriad invertebrates, birds and small mammals that would otherwise live and feed at ground level and means that the standing dead trees, with all their nooks and crannies and resident fungi, remains the only valuable habitat available to wildlife between the tree canopy and the thick layer of leaf litter below. 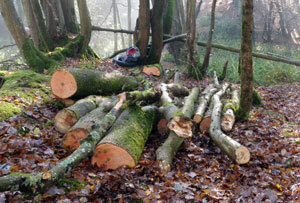 In November, four of my regular conservation volunteers and myself, began the process of coppicing some of those medium sized trees (mainly Hornbeam) to thin out the areas agreed with the Forestry Commission. 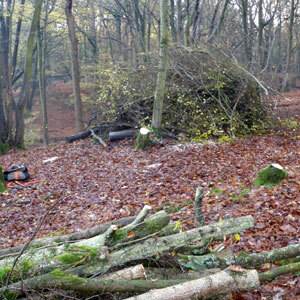 The logs and brash were piled up in separate heaps to create bug piles (hibernacula) and a few of the taller trees were felled and left to decompose naturally on the ground (to simulate a windblown tree), which also provides food and shelter for many invertebrate larvae. Of course, having a storm kettle on site means that a brew-up is never far away and makes the day more enjoyable as well. Unfortunately, the snow before Christmas curtailed our second session but we will be back to carry on our task in January. 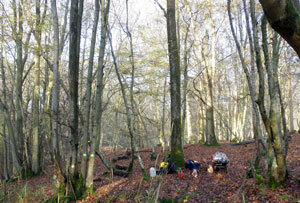 As I write this, we are holding a SWOG meeting in our copse this Sunday (December 12th) to highlight our aims and meet other like-minded individuals, so I hope that the weather gods are smiling on us and that other woodland owners can pick up a few tips on improving their own properties to attract more wildlife in the future…as they tuck into their free Christmas nibbles! For anybody interested in ‘managing their own woodland for wildlife”, I can thoroughly recommend the PDF by David Blakesley and Peter Buckley, which is available to download from the Woodlands website. 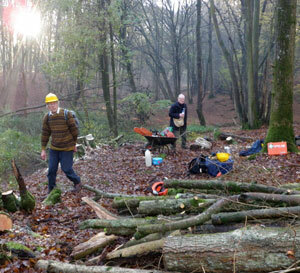 Alternatively, if you need work done, but don’t have the manpower to do it, have you tried your local conservation volunteer groups? There are a variety of organisations, such as the Wildlife Trusts, (which includes Gatwick Greenspace Partnership), Green Gyms (under BTCV) and smaller, independent groups that work on private land for a small donation to their running costs…Your local Volunteer Centre should have details of a group near you, so why not give it a try?